Left - Sweetheart cracker jar. 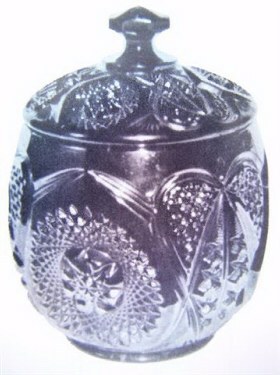 Right - Sweetheart jar as shown in NEARCUT Cambridge catalog. when the pattern is seen on Green and Marigold Cracker Jars. Doug Siska has discovered this latest example. 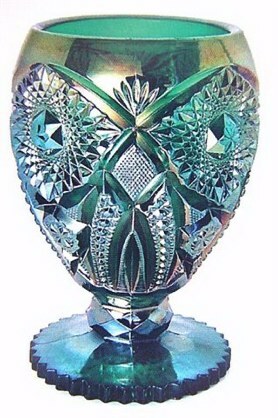 This pattern was used extensively in crystal but very few items were carried over into Carnival. Cracker Jar: Only 2 or 3 of these are known in green and one in marigold. An amethyst has been reported. This jar is of generous size, measuring 8 ½” tall, 6 ½” at the widest point and 4” at the base. 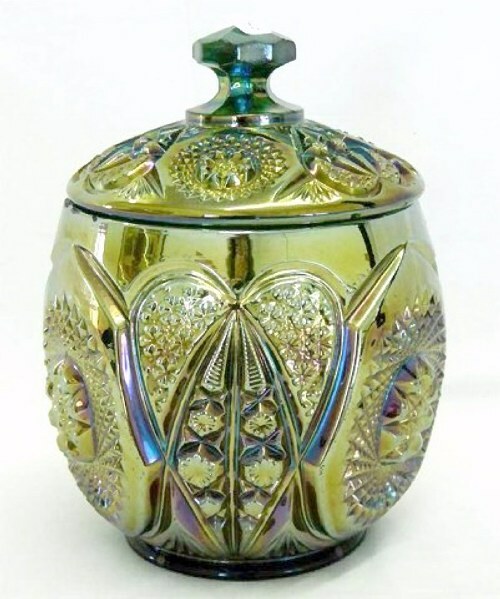 Considering the scarcity of these pieces, the report which came from Margaret and John McGrath of Australia, that they had discovered a green cracker jar sitting on the shelf of a second hand shop in 1999, was a real revelation! They did say it was no real “bargain”. The only one we (D & D) have been privileged to see, was the lovely marigold example brought to Air Capitol Convention in Wichita some years ago by the Lacock’s. Tumbler: Only some half dozen of these are known and documented in marigold. One of these was sold in a Burns Auction in Ohio in 1989 for $500. It was the first public sale of an item in this pattern for ten years. A pitcher has never been found. Vase, and or Lamp Base: sometimes called a giant rose bowl When fact is lacking, conjecture becomes pertinent. There is no question about use as a vase. An old Cambridge catalog indicates its use as a lamp base. During our first 20 years of Carnival Glass pursuits at full tilt, this piece was attributed to Cambridge with no questions asked. 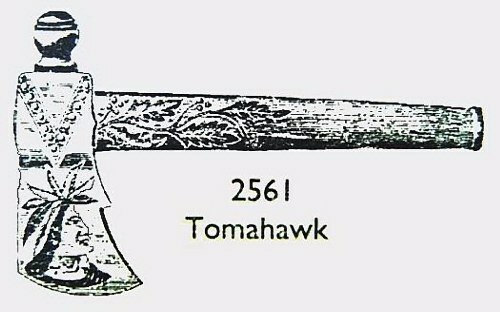 Along in the early ‘90’s, the late Bob Gallo spoke with a person who had found a shard of this piece at the Millersburg site. We will all agree that the foot and the stem have all the characteristics of the Millersburg Hobstar and Feather Giant Rosebowl. 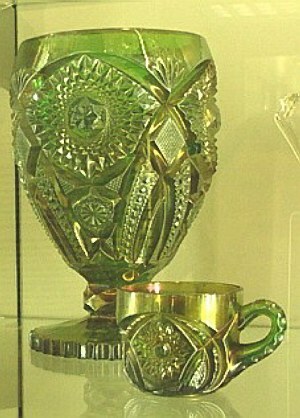 This altered former beliefs somewhat, although since Cambridge Glass was in the glass-making business prior to Millersburg’s entry in about 1910, we hasten to add that since Imperial, Sowerby, US Glass, and perhaps others “borrowed” ideas and designs from one another, that practice MAY have taken place with the Venetian, as well? Another possibility is: Iridization took place at the Millersburg factory. What difference does it make? We further venture that there are many fewer of the Venetian than Hobstar and Feather Rosebowls today. Only a dozen or so are known in green and only 2-3 in marigold. This piece stands 9” in height. They are unsigned. It is a heavy, impressive piece of glass, to say the least! CREAMER AND SUGAR: One rare set in marigold is known. 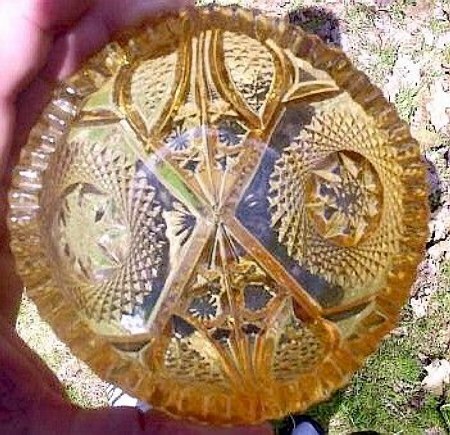 COVERED BUTTER DISH: Known in marigold. Venetion Lamp as seen in the NEARCUT Cambridge Catalog. 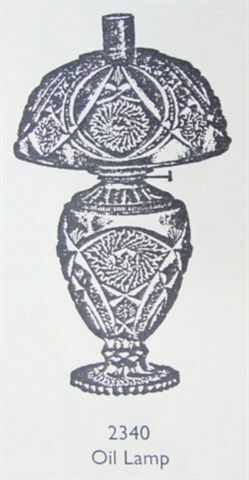 Please see chart of Cambridge pieces taken from a Cambridge catalog, along with an article written by Mary L. Adams in this site segment called: Cambridge Carnival Glass where the complete oil lamp is shown. Green Cologne Bottle in Wheat Sheatf pattern as displayed in Museum-4-15-04. WHEAT SHEAF Cologne Ad from the Cambridge catalog. In writings by Don Moore in the ‘80’s, no attribution was given to this piece. David Doty comments in his book that despite the cologne or barber bottle reference, this piece is part of the Cambridge Wheat Sheath family. Seen mostly in green carnival, it stands 8 ½” high with a base measuring 3 ¼”. At least one has been confirmed in marigold. Should you find one without a stopper or one having a clear stopper, the price drops about one-third in value. A couple of these sold without stoppers at the Seeck auction conducted for Jack and Mary Adams on Nov. 22, 2003~~for $80. choice. 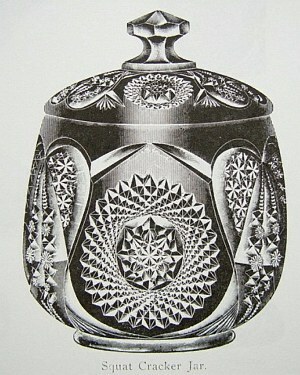 The photo used in this article is of the complete Cologne Bottle, as seen in the Cambridge Museum. 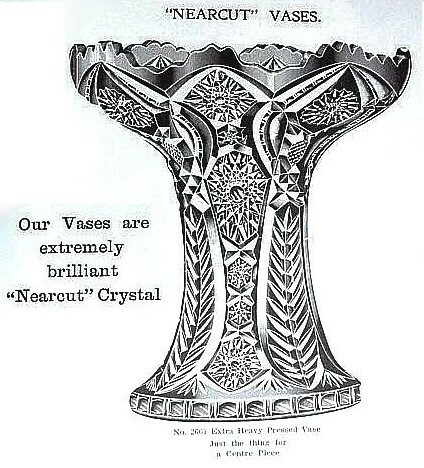 The design features are more clearly defined in this ad than in the photo of one which sold a year or so ago at auction. This novelty item is known in both blue and marigold in the vintage variety. It has been reproduced. Only 2-3 of the old type are confirmed. During the early 1980s, when the late Don Moore was actively collecting/researching, his estimate of value for one of these in blue was $1350. Our understanding is that Mr. Degenhart purchased this mold from the Cambridge Co. and took it with him when he retired. He had worked for Cambridge for many years. 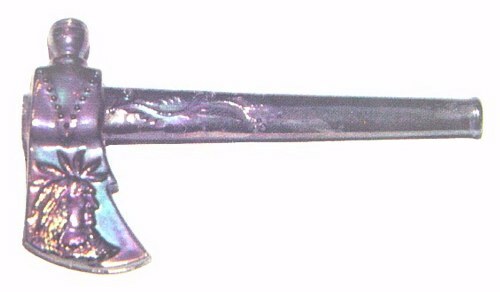 This Tomahawk has been reproduced in purple carnival, and in vaseline, amberina and aqua colors - not iridized. Its departure from the “norm” lends a “show stopper” impression. It is 7¼” long x 2” wide. The old, as well as the newer versions carry the Nearcut trademark. (Please see comments about this piece in the account written by Mary Adams for the Cambridge Soc. Newsletter~~to be found in the Cambridge Carnival Glass segment of this site. From all appearances, the designation may be quite correct. All of the Cambridge designs are not listed in this Nearcut catalog we use for reference. If anyone can shed more light on this pattern, we would be most happy to hear from you. 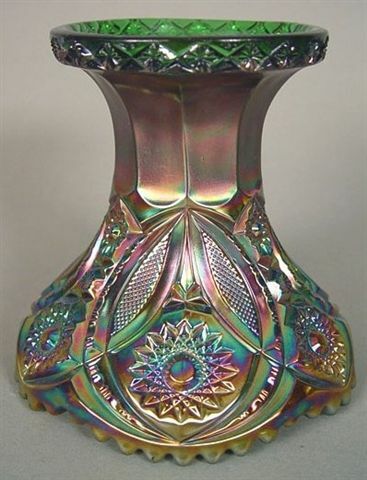 In discussing this piece with Debbie Remmen, while attending the 2004 ACGA Convention, she said this “vase” came from the home of a non-carnival glass collector, and sold for $550. in her recent St. Louis auction. 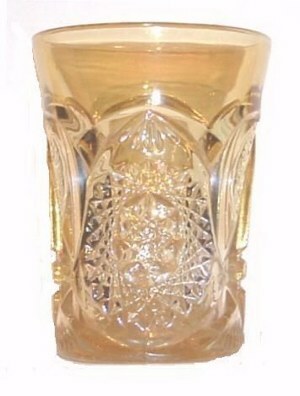 That price is in line with prices of other scarce to rare iridized Cambridge Glass. Had we not seen evidence of marketing as such, probably none of us would ever have arrived at such conclusion. “Proof is in the print.” Actually, many of the punch bases make very effective “candle holders” when decorated with a floral wreath for accent , so with imagination, many of them could become vases, as well.